We’ve yet to come across an organizational effectiveness model without leadership development as a major component. Whether conducted on an individualized coaching basis, or through a well designed program for training up and coming leaders, everyone benefits from increasing their leadership competence and capabilities. The more talented and competent leaders you have, the more you drive, grow and sustain your mission. 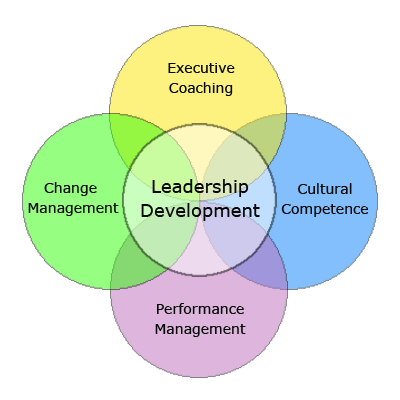 What differentiates the creativechange.biz approach to leadership development from other methodologies is three-fold. First and foremost, we respect that every client situation is unique and requires a customized approach. No canned product. Second, we help our clients create programs that empower and energize their people to drive the process, and take responsibility for their own development. Third, we work with our clients to practice the new skills they acquire to reinforce the learning and insure that it sticks. We are expert at helping you accurately assess your leadership development needs, and clarifying the desired outcomes you seek to achieve. We help create a strategy to grow the talent pool of competent leaders, and design effective training programs on the leadership competencies most important and relevant for the client’s needs and objectives. We work with our clients to define what competent behaviors look like, and further support the process with practical training on communication and feedback skills to maximize growth and improvement. Leadership development is a core component of the five main services we provide our clients. The diagram below demonstrates the interconnection and influence they have on each other. The importance of leadership development for an individual, or an organization is striking when viewed this way. Let us help you integrate the leadership components required of today’s organizations.